Our range of key clamp type tube & fittings can be used to form a simple, cost effective handrail system which is easy to assemble. There is no need for bending, threading or welding. 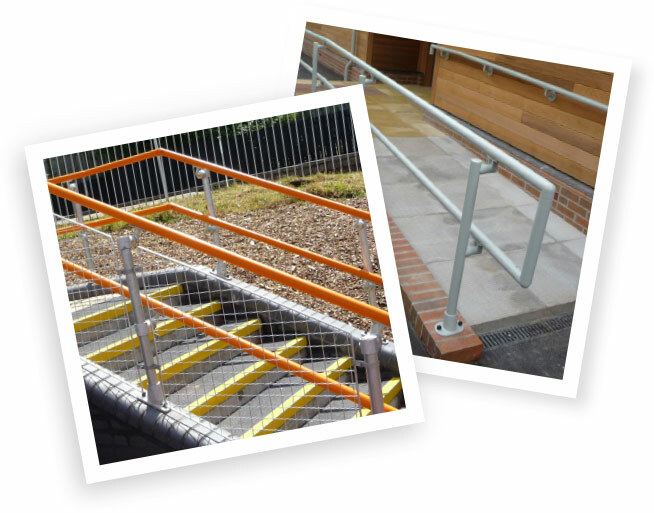 The GRP Handrail System is made of premium-quality glass reinforced plastic, an innovative material that has many proven advantages over traditional galvanised steel systems. Our Roof Guardrail is specifically designed to provide free-standing roof edge protection with no penetration of the roof surface. The DDA Handrail System enables architects and contractors to meet the requirements of Building Regulations Part M.
Ezi Klamp Systems are a leading supplier of Armco-type corrugated crash barrier which is the preferred option for off-highway protection by contractors UK wide. Cycle Stands, barrier hoops and bollards are a common feature in many public spaces and are currently used in a wide range of settings. The DDA Handrail System enables architects and contractors to satisfy the requirements of the Equality Act 2010 (formerly Disability Discrimination Act -DDA) and Building Regulations Part M: 2006. Ezi Klamp Systems are pleased to introduce an alternative pali- sade fencing system. Ezi Klamp Systems are pleased to introduce an innovative range of handrail systems. If you require a quick, easy and cost-effective handrail, then the Ezi Klamp system is ideal for you. Strong pedestrian guardrails are a requirement in many industrial and roadside settings. The Free-Standing Roof Guardrail System has been specifically designed to provide roof edge protection where regular inspections are required. Ezi Klamp Systems are a well-established UK based company who specialise in the supply of key clamp type handrail systems, guardrails and barriers. Having been established since 1998, we’ve built up a fantastic reputation among a wide variety of clients nationwide. Was expecting delivery on Monday but got the goods on Friday. Had an early delivery! It went fine, no problems at all and came in next day. Customer had delivery immediately. Competitive, efficient and quick to respond on tight deadlines. Service very good, very reliable, delivery on time, good price, good all round.